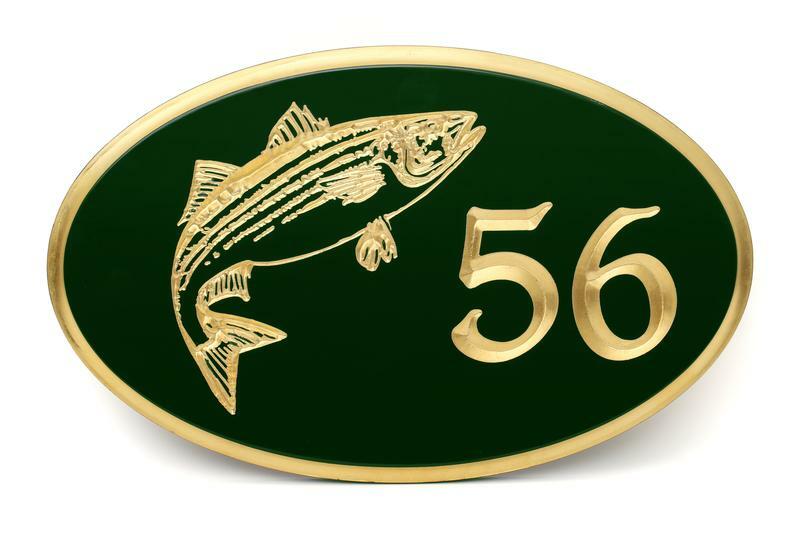 You're currently viewing product Oval House number with Fish in category House Number Signs. 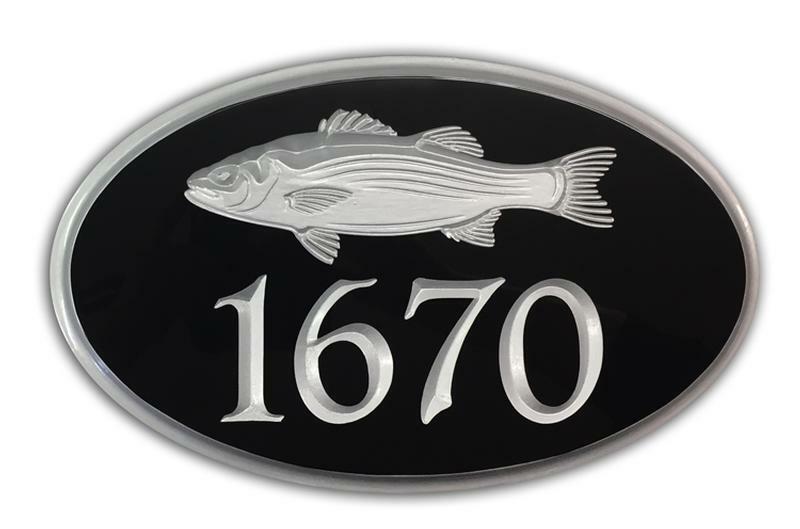 Oval House Number with an engraved striped bass. Available in 6.5" x 10", 8" x 12" and 9" x 14.5" sizes. 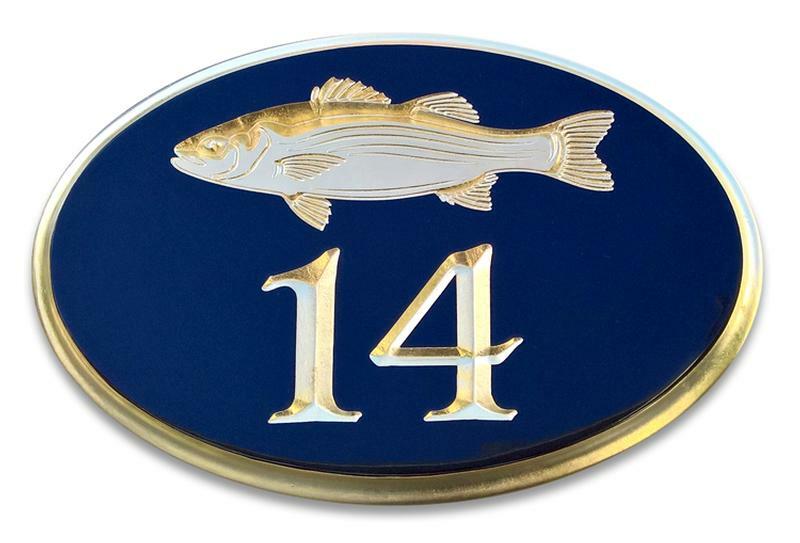 Numbers, edge and motif can be finished in 23k gold leaf or metallic silver finish. This sign is available with hidden hardware and instructions for mounting to a wall or eye hooks for hanging from a post. Please check the main page for shipping lead times. Please request a proof in the comment section when placing your order. If you choose a custom color, please send us a swatch or sample as soon as you are able. You can purchase a bracket or ground stake for your sign by clicking on ''Sign Brackets'' on this website. When doing so, please select "Sign Shop Bracket'' or "Sign Shop Stake" in the box under ''attachments". ****For double sided signs, please give us a call at 800.547.4467. Please keep in mind a double sided sign will cost 75% more****** PLEASE SPECIFY IF THE SIGN IS DUE BY A SPECIFIC DATE IN THE COMMENT SECTION WHEN PLACING THE ORDER.